Congratulations and best wishes for a wonderful pregnancy! Sono felice per questa bellissima sorpresa,dacci spesso tue notizie. un bacio a te e al piccolo Vici. Congratulations! I wish you a healthy happy pregnancy and a baby boy as handsome and smart as his mother is beautiful! Hi Laura. Congratulations. Miss you so much. Congratulations Laura! That's great news. Best wishes for your pregnancy! Woot Woot! That's fantastic news Laura!! Congratulations! I'm so happy for you! I hope that you have a wonderful and easy pregnancy and make yourself some awesome maternity outfits!!! aaaaaahhhh! Congratulations! That's great news! That's wonderful news! I hope you are feeling great and have an easy pregnancy. Congratulations! I'm so glad to hear you're alive and well. Glad to see you posting again and congratulations! That's so exciting! Congratulations! I send best wishes for you and your family--how wonderful for you! Wow, congratulations! What a great reason to return to blogland! Congratulations! What good news. Have a good pregnancy. How crafty indeed;) Congratulations to you both! How exciting Laura! I sure miss you blogging and hope you pick up your blog again soon. Congratulations!!! That is so wonderful, Congratulations! Congratulations! Can't wait to see your future creations. I've missed you, so happy to read about the pregnancy. Congratulations. Lovely to hear from you. And congratulations. Email me when you get time, ok? Wow, now that's more than an "I'm back" announcement. Congratulations! First because you've been missed and it's good to know that you're well, and second on your very happy news. Congratulations on the good news!!! What joy to hear from you again. well, how about that?! congratulations! Congratulations! Thank you for sharing your wonderful news, Laura! I hope you find the energy and the time to blog since we all enjoy your contributions to the sewing world very much! Since I had my daughter, I've hardly had time to take care of myself so blogging has slipped far down the list but I, and the rest of your fans, do love to read. I wish you a happy and healthy term and a happy and healthy baby! Congratulations, we don't know what we are getting, except that it will be twins (17 weeks pregnant now!) Hope your pregnancy goes well! Babies are such a blessing. I am glad you checked in with us. We miss you, you know. I am sure you will have a beautiful baby boy. What wonderful News! Congratulations. Thanks so much for letting us know. Now you can sew up some baby clothes. That will be so much fun. I can wait to see some beautiful baby pictures. 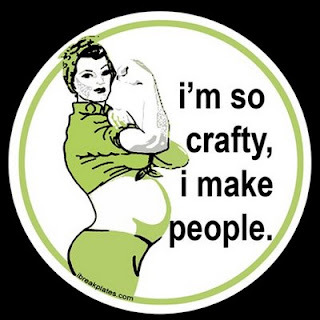 Have you been making your own maternity clothes? How are decorating the nursery? CONGRATULATIONS!!!!!! Sending you good vibes and blessings all the way from Portugal! I wanted to say I have left you a Sunshine Award on my blog (http://plookiss.blogspot.com/) for you to pick up for having a great inspired blog. Thank you and keep up the brilliant work! Wonderful news!!! Congratulations, and please don't go another 11 months before posting again!!!! CONGRATULATIONS! How exciting for you! Best wishes for a healthy mom and baby. Congratulations, and great to hear from you. Best wishes for you and your baby. Congratulations and all the best for your pregnancy! Congratulations, Laura! That's wonderful news! And it's good to hear from you again. Best wishes! So so happy for you!!! I hope the rest of the pregnancy goes very well for you. Hi Laura, I'm so glad you are back, and with wonderful news too! Enjoy! Fabulous to hear your news, new reasons to sew! God bless you and your family, great to hear from you, we've missed you. Great news! I'm so happy! Congratulations! Laura, so great to hear from you, and with such good news! Congratulations! Congratulations! Take care of yourself. Congratulations! So glad to see your post. This is so exciting to hear. congratulations. YOu will find so many things to sew for your little one. I was surprised that I found so many things to make him. People would stop us and comment on his matching hats and pants often. Felicitari!!! sper sa gasesti si timp pentru cusut, acum vei avea nevoie de o noua garderoba :) Super! Congratulations! I missed this in Feb. :( I really hope you're doing well and find some time to sew now and again! Miss you!! I'm a bit behind, but wanted to wish you huge congratulations! Congratulations Laura, I was a fan of your blog and worried because we had no news. Have a wonderful and happy pregnancy, enjoy it. Congratulations. Wonderful news. 2010 is going to be a fantastic year for you and your partner. Congrats on your new little one. Motherhood is one of your most exciting adventures in life. Hope all goes well for you. Check out Ottobre for some cute children's clothing to sew when you can. May you both be happy and healthy! I'm a little late but Congratulations! You have been missed! So Laura, do we get to see the baby? Laura congratulations on your pregnancy. How wonderful. Congrats Laura! I had mine in April (twins!). Isn't it crazy that it's been (almost) a year? Miss your posts! Hope all is well with you and the baby!